The last band playing '70s-influenced art rock just keeps on ticking, and "Radiation" is yet another solid release from this British quintet. Unlike some of Marillion's recent work, this is not a concept album where all the songs have a common link, but that only serves to make the album more accessible to potential new fans. 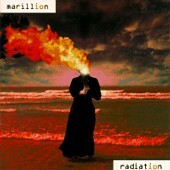 And don't fret, Marillion-heads, each track stands on its own as a mammoth production with great attention to detail. The disc opens with a pair of blistering rockers. The ozone-layer anthem "Under the Sun" begins with a comical acoustic intro, stating "The hole in the ozone layer is allright by me / makes England warmer in the summer / what's wrong with the odd melanoma / if it gets us out of the coma." Right away, even a Marillion virgin becomes aware that this isn't your everyday rock band. "Answering Machine" follows and rocks even harder, a synthesis of old school tempo shifting and contemporary guitar noise. Then the drama kicks in with one of Marillion's best songs ever, "Three Minute Boy." A seven minute epic in the grand tradition of progressive rock, it tells the story of a one hit wonder rock star, a theme that could be butchered in less capable hands but holds up nicely with lines like "They played him on the radio / from Tokyo to Timbuktu," and a love story that ends with "She's going out with someone new / in this week at number two." On the other hand, the next track, "Now She'll Never Know," tackles divorce, a rarely heard topic in rock. But again, it's handled superbly in true Marillion fashion, thanks to both a spare and moving musical arrangement and an uncanny ability on the part of singer / lyricist Steve Hogarth to refrain from an it's-all-your-fault mindset and to see a situation from both sides. Like most art-rockers who influenced them, Marillion occasionally do get heavy handed. "Cathedral Wall" is a risky gothic number that only proves that mixing Genesis with Marilyn Manson doesn't quite work. And the let's-all-love-each-other anthem "A Few Words For the Dead" takes over ten minutes to say what the Beatles could say in three minutes. But overall, "Radiation" should not disappoint either long term Marillion fans or newcomers who are looking for some high quality thinking-person's rock.